I completed successfully (but just forgot to post about) & I lost 1 more pound! That put me at the 10 pound marker which was a great accomplishment. This week pretty much got thrown out the window in regards to getting healthy. It was the week before our big trip with lots of “to-do’s”, I had come down with a virus, & I was also hosting a Mother’s Day brunch that weekend… so I could ramble on and on the list of excuses but if you want to know what happened – life happened. We were on a super exciting trip to JAPAN! We had a wonderful, wonderful time. Although I wasn’t eating a very healthy diet, we were doing TONS of walking (and even hiking). When we got back & I weighed myself, I weighed exactly the same as I did when we left – looks like all the walking and all the eating cancelled each other out! Hey, I’ll take it! Then I thought to myself “Self, not only are you exhausted due to jetlag but you are re-entering reality. You need to give yourself a break, let your body recover & then worry about working out and eating healthy”. Week 14 started on Wednesday, 6/12. It would have been a great time to re-engage in this effort but, you see, we left to go out of town the next day. Matt was in a (beautiful) wedding in West Palm Beach and we left that Thursday for the festivities. So that brings me to now…. I have officially fallen off the band-wagon and let’s count it up… I have been on this ‘sabbatical’ almost as long as I have been on this journey. Crap. Imagine where I would be if I hadn’t taken so much “time off”. And here is the extra bad news… Although I weighed the same when we got back from our trip (in the middle of week 12), these additional weeks of eating poorly and not hiking around Japan have, well, caught up to me. Double crap. So not only have I missed a chunk of time on this journey (okay, we’re all thinking it – let’s just say it – six. six weeks. ), I have also managed to gain back 5 pounds (and I’m sure lost a bit of muscle too). Please say it isn’t so. So I am entering Week 15 with a loss of only 5 pounds… and just typing out that statement makes me want to forget it. As much as I want to “throw in the towel”, I want to “throw in” these ‘fat pants’ even more – SO, although it feels a lot like starting from the beginning, here we go again! & as much as I really don’t want to be – I’m back! Well guys, I have officially completed 7 weeks. Check out my tracking & thoughts on week 7. Here is a recap of my WW+ points for week 7. Overall, I did well & used 14 of my weekly bonus points. Below is a recap of my exercise for week 7. I worked out 3 times which does NOT reach my weekly goal. As you can see, I haven’t exercised for the last 3 days (I try not to “rest” two days in a row). Sunday was my intentional & scheduled day to rest but that wasn’t the case for Monday and Tuesday. I know it’s terrible & not encouraging at all, but I have just been “over it” the last couple of days. You can read more about that in my “thoughts” section below. I also tried doing less weight machines and doing more reps on the ones that I do. I found that I was more “sore” the next day with that method, which to me means more progress. I am feeling a little discouraged today because I was really hoping to be further along at this point. As some of you may know, my hubby & I have a big trip coming up in just 2 weeks! We are really excited but I had hoped to be able to fit into my ‘big girl’ summer clothes so I could avoid buying a new summer wardrobe. Unfortunately, I don’t think that is going to be a reality for me as they are still a little too snug for comfort & there isn’t much time left! I had just hoped that, after 7 weeks of this, I would have more to show for it. Even if it wasn’t a number on the scale, I was hoping to at least be able to fit into some of my clothes or have lost more inches all around. It is discouraging to think that 7 weeks ago I ate whatever I wanted & had an hour back in my day… and I was wearing the same clothes that I am wearing today. When I start to feel a little slimmer and try on a pair of pants (that were at one point too big), and they are still too tight… it makes me want to just forget it! I know that I am just in “a funk” today and that in the bigger picture, I have made great changes to my health and to my body but as I reflect on week 7, I am not impressed and am feeling very much “over it”. I am really sorry to be a Debbie Downer today but my goal is to be honest and transparent with you guys about this journey – so that means I share joy in the great weeks & disappointment in the less-than-great weeks, right? For all of you who are working hard to reach your health goals, I hope you are having a more encouraging week than I am! I know that I have to stick to it & that is my plan – and if I keep up with this pattern, I should reach the “10 pound” marker at the end of this week so that is something to work for (or so I am trying to convince myself). Good luck to all of you as we start week 8! Here is a recap of my WW+ points for week 5. Below is a recap of my exercise for week 5. I am excited because I worked out between 50 – 55 minutes each time this week! Doing my ‘new’ treadmill work out has left me drenched in sweat each time & I sort of love it. I felt like each of these work outs were great! I would like to incorporate more weight-lifting into my routine. I have been making a point not to lift weights two days in a row. With the way my rest days and non-weight days are lining up, however, I am only getting weights in about twice a week and I would like to increase that. I have also been increasing pounds as I am able to handle it so that progress feels good! As I mentioned before, I do not have any tracking for week 6. I did count points on 2 days but didn’t feel it was worth sharing considering I don’t have anything for the rest of the week. Since I only got one work out in, there also isn’t much to share there. For week 6 I did not lose but I did maintain (well, I lost .2 pounds but I am not counting that!). Obviously, it is much more exciting to lose BUT considering the week “off” that I had, I am happy to not have gained! I am really excited to have completed 6 weeks of this journey. I feel like my body is starting to adjust to a healthier lifestyle and for that I am grateful! Although I gave myself permission to “slack off” a little during week 6 for my birthday, I am so ready to get back to my routine. It is nice to allow yourself some flexibility at times but, as the norm, I am truly enjoying a healthier lifestyle. I didn’t realize how much until I took almost a full week off. I cannot wait to get to the gym and sweat tonight! I am planning to really buckle down this week. 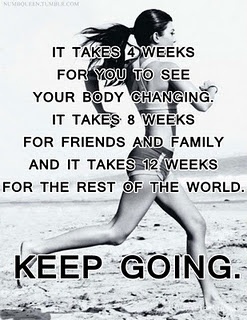 With conscious healthy eating & great workouts, maybe just maybe I will reach the 10 pound mark at the end of week 7! Wish me luck (& good luck to you too)! I have been slacking on my updates this past week but I have a good reason – it was my birthday! & if you know anything about me, you know I LOVE birthdays & you know I require a full week of celebrating! I will combine my week 5 & week 6 reviews in a post later this week but I wanted to share with you all something I learned about my body this weekend. So what did I learn, you might wonder? A few of things. It turns out I don’t really care for my food to be covered in grease – something I didn’t really notice before I started this journey (almost 6 weeks ago!). You might remember me mentioning that I was craving a burger. Not a nasty drive-thru burger but a good, juicy burger from a restaurant. I resisted time after time because they are high in points and not a very healthy choice. Thursday for lunch we kicked off my long birthday-weekend by going to lunch. There on the menu I saw a burger with goat cheese and avocado – yum! It was my birthday, after all, so I indulged and ordered it. I was so excited! Out it came – it looked great…. But after a few bites I set it down and pushed my plate away. Gross. It was so greasy. & the French fries… I LOVE French fries (let’s be honest, I love potatoes in any form) – also greasy. I had two or three and didn’t touch them again. I thought it might just be the restaurant we were at but I am realizing that isn’t true. A few nights before, I had counted my points just right to allow myself to have tostadas for dinner from TJ Flats. Guess what? They were greasy. And while were away for the weekend, we shared some chips & guacamole and the chips (I think we know where this is going) were also greasy. It is almost as if my body is hyper-sensitive to greasy foods. 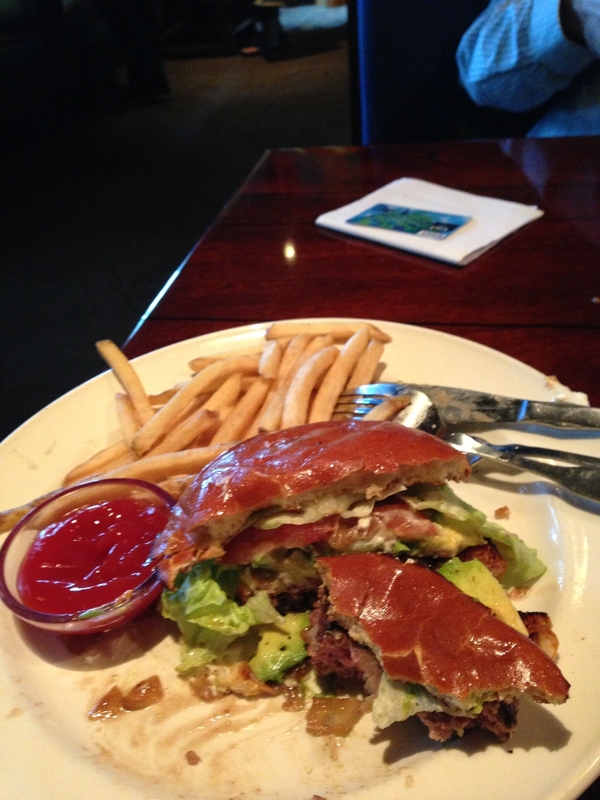 Although, at first, I was a little disappointed that I didn’t like the burger I had been craving for weeks… I am realizing that this is actually a good thing. That means I have been avoiding these types of foods for long enough that my body would prefer healthy choices instead! I certainly won’t be ordering a burger, like, ever again. This is not as strong of an aversion as the greasy foods, but MAN – some of the sweets I used to love are just so, so sweet that I can hardly stand it. For instance, my very favorite drink at Starbucks used to be a white mocha with whip. Don’t look it up – it’s horrible. Over time I have transitioned my go-to drink to a tall, non-fat caramel latte. 4 beautiful points. When I decided to “treat” myself to my white mocha, I realized that it was…um…disgusting. I was shocked. It is literally so sweet that I cannot get it down without making a scrunched up face – and cannot even think about drinking more than a sip. The same is true of other sweet treats – although certainly not all of them as I still have a mega sweet tooth. Although I had given myself permission to enjoy some of my favorites over the long-weekend, I found that usually 2 out of 3 meals I picked items that are point-friendly – items that I would normally pick on the days that I am focusing on healthy eating. Why? I found myself afraid to order anything I used to “love” because I was repeatedly disappointed & the healthier choices that I was used to choosing were, well, better. Is your jaw dropping? Mine is. I even said several times over the weekend how much I wanted a salad or some broccoli – as if my body was craving the nutritious veggies it was used to eating. & while we are at it, some of the portions that restaurants give you are huge! & I used to eat the entire thing! Since I have changed my eating habits, I am realizing that I get full much faster AND I have no desire to eat past that point. I think it’s important that I put this disclaimer out here. Although a lot of the foods I thought I would like turned out to be a huge disappointment after eating healthier for these last 6 weeks, other foods are STILL delicious. Like pizza from Lazy Moon (a favorite Orlando pizza-place). It’s delicious and it always will be. Like the pumpkin bread from Starbucks – again, delicious. 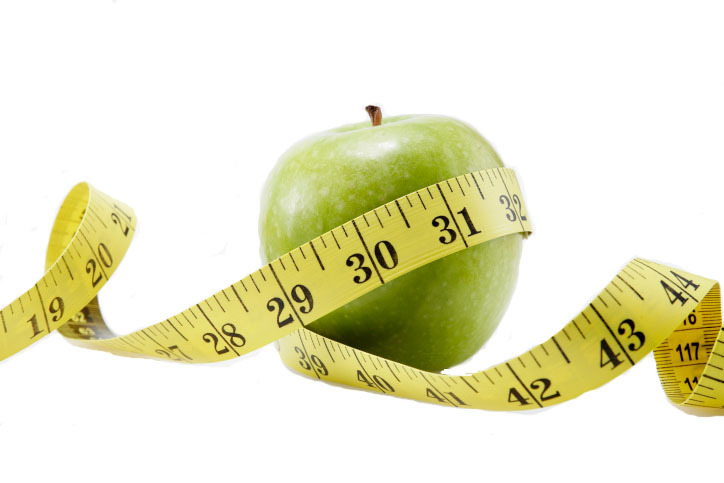 SO – in a nutshell, what I learned is that as my body is getting healthier – I am preferring healthier options. & although there will always be those foods that I love no matter what, as a general consensus, the unhealthy choices are literally not worth it – not just because they are unhealthy but also because they are kind of gross!! Before I got started on this journey, I took my “before” measurements along with some “before” pictures. I am not prepared to share those numbers or pictures quite yet (yikes!! ), but I do want to track how many inches I have lost at the one-month mark so – here they are! I have to be honest – I was a little disappointed to see these results. I know it is a great start, but I was hoping for a little more than that after an entire month! I lost an inch pretty much all-around with the exception of my arm (what’s up with that?! ), and before you suggest it is muscle tone let me inform you – it definitely isn’t there in a measurable way…yet! Although I am a little bummed that I haven’t lost more inches, I will say that I can tell I have lost fat – especially in my face & around my mid-section (which is a place that I didn’t measure to start). I am also still continuing to lose pounds each week (let’s cross our fingers that I lose this week too! ), so that is still progress and that is all I can hope for – am I right? Okay, guys! I cannot believe that we have already completed 4 weeks! I am not going to say that is has been easy because those of you following my blog know that it hasn’t been – BUT I am really glad that I have 4 weeks ‘under my belt’ & am getting ready for week 5! Below is a recap of my exercise for week 4. I was able to make it to the gym 4 times this past week, which is within my goal/plan. Thursday night was difficult for me as I was feeling tired & worn out from the week. Fortunately, I didn’t completely destroy all of my efforts like I did last week (you can read about that here). I did decide to just exercise using the Gazelle at home instead of going to the gym. It was much less intense and I burned less calories than I would have burned at the gym for the same amount of time (1 hour), but I am glad that I got the exercise in either way! Plus, I got in some great workouts this week as well. Guess what, you guys?! This week I lost…. Watching what I eat & exercising is becoming a lot more natural for me now. It is not easier, that’s for sure, but I am starting to get in the mindset of “oh well – that’s just how it is”. 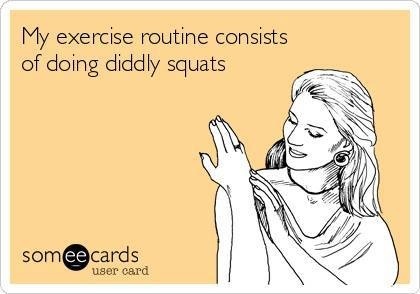 On the days I really don’t feel like working out? I do it anyways. On the days that I am really craving a juicy bacon-cheeseburger that is about 30 points (which has been all this week, by the way)? I choose the grilled chicken breast instead. It’s not always easy and I’m not always a good sport about it BUT I always feel good about the choice after the fact. Also, my last two work outs have been great! I have a new burst of motivation and energy and, let me tell you, I had no idea I could sweat that much. I think for the first time I experienced what they call a “runner’s high” – and I wasn’t even running the whole time! 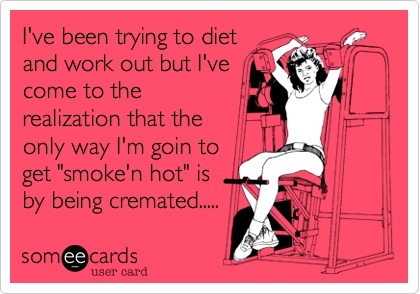 I am hoping that if I can put in work outs every day like my last few…I will see even better results! Good luck you guys! I know that there isn’t always instant reward for working out and eating healthier foods BUT keep in mind how much your body will love, love, love you for it (& I’ll love you for it too)! Start with making your sauce since it takes the longest. 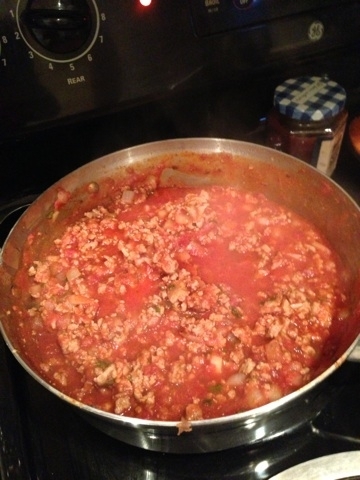 We used ground turkey instead of ground beef, so it was probably less points than the recipe indicates. 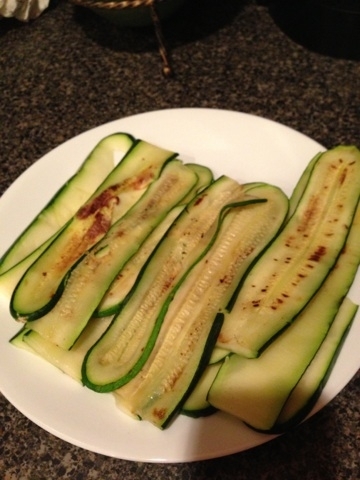 Next grill your zucchini slices. We used this grill pan instead of an actual grill. Worked like a charm. 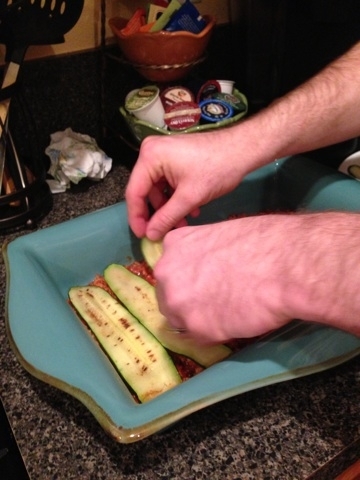 You will also need to salt the zucchini before grilling & will need to absorb any excess moisture with a paper towel. 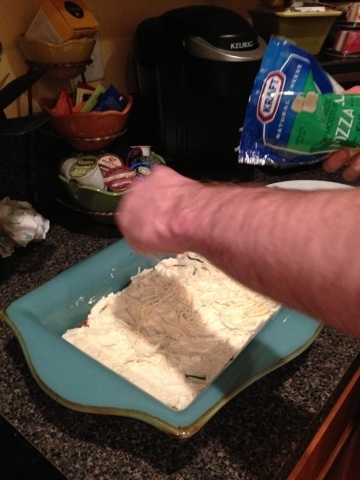 Mix together your ricotta cheese mixture. & top with mozerella cheese. Repeat. 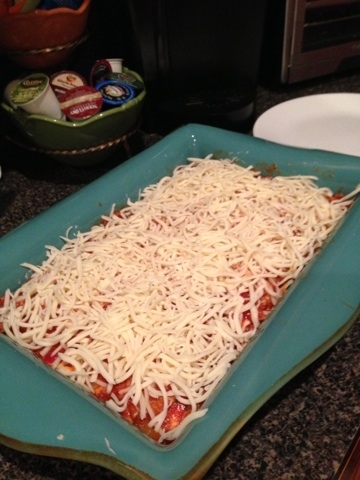 Top the final layer with mozerella & cover with foil to bake for 45 minutes at 350 degrees. Then for an additional 15 minutes uncovered. 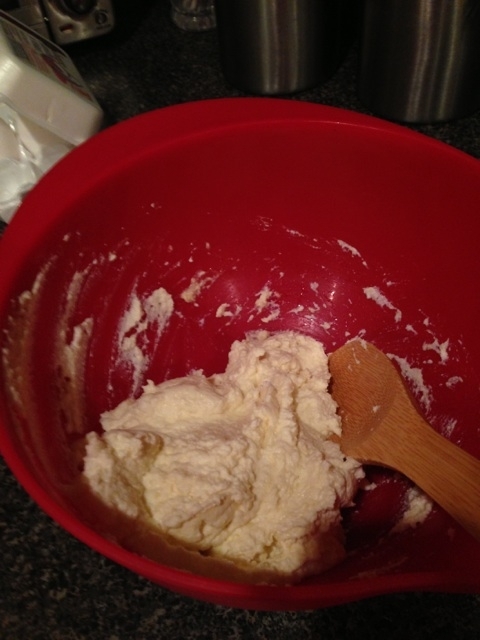 This is about the size of 1/8 of the pan (which is one serving size). Yummy! 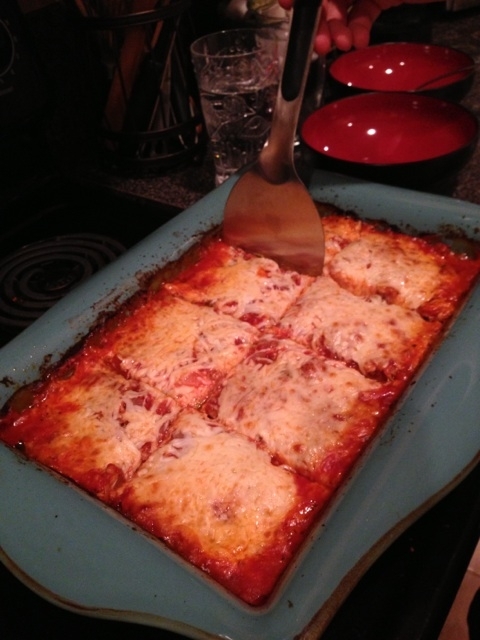 I loved the homemade sauce – it was easy and didn’t take too incredibly long but the flavor was amazing!! 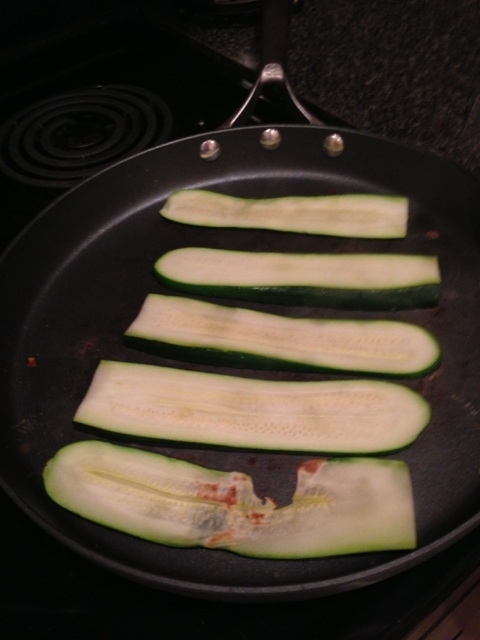 I really liked the zucchini in place of the pasta – I actually liked it more! It was healthy, had good flavor, and I didn’t miss the pasta once. 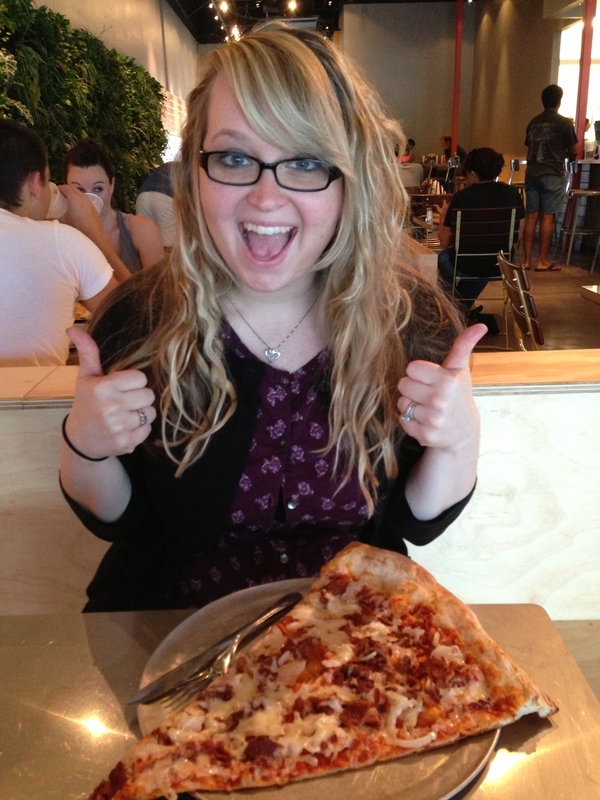 I loved being able to enjoy a favorite meal without feeling guilty! It was delicious & smelled amazing! It does take a long time to make (but totally worth it!). 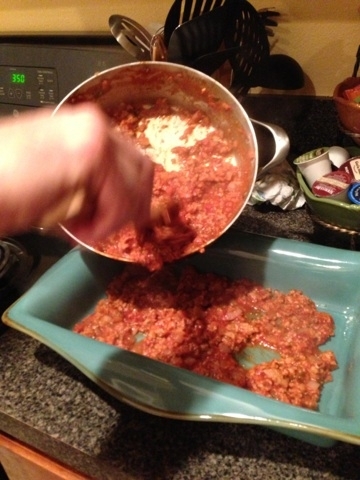 A good idea might be to make the sauce (whether you are using the sauce in the recipe or your own sauce) a day before – then it won’t take long to throw together at all. It also would have been faster if we had a mandoline to slice the zucchini but since we didn’t, we just used a knife & it worked just fine! I felt like there was too much cheese! My hubby thought the cheese ratio was just perfect, so it might just be me as I am not a huge cheese-lover anyway. I ended up scraping about half of it off my piece – next time I won’t use as much on my half. I didn’t think there was enough zucchini. 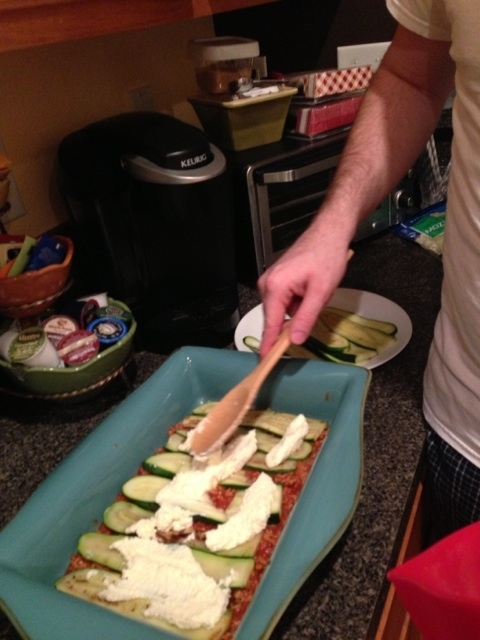 We followed the recipe but their zucchinis must have been bigger than ours were. Next time we will probably use twice as much! Yum! 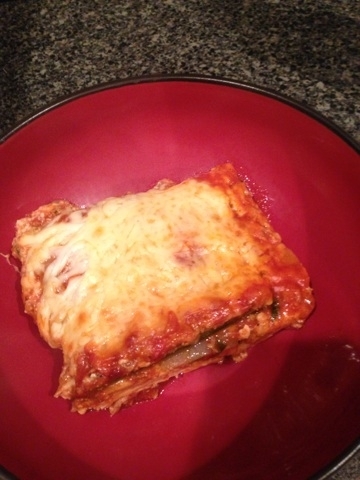 This recipe was 9 WW+ points for 1/8 of the pan, which I felt was a generous piece of lasagna. We partnered this with a small side salad & a large glass of water. & it made for great leftovers, too! P.S. For spaghetti, I also subsitute spaghetti squash for the pasta. It is delicious, I promise! I actually prefer it now & would eat it even if I wasn’t on a quest to get healthy! Amanda Smith on I’m Back!